With that said, I expected some performance differences between the MU8000 and the KS8000. More on this later. The MU8000 is available in 49″, 55″, 65″ and 75″ screen sizes. This review can be applied to all screen size, as they should have very similar picture quality. For more info on the MU series click here. The MU8000’s build quality is quite nice and transforms to a beautifully designed television display. The bezel is very thin and features a black boarder that surrounds the screen and is highlighted with a razor thin silver accent trim. The screen finish is semi-matte, and is illuminated with edge-lit LED backlighting. 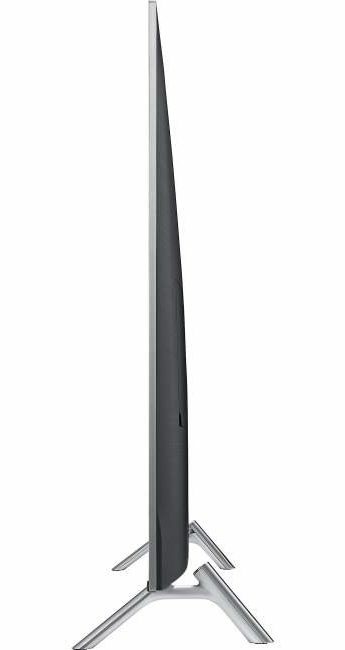 The MU8000 has a very thin profile, as well, when viewed from the side and has a maximum thickness of just under 1-3/4 inches. Samsung uses two “Branch Shape” feet to support the display panel which do provide good support. New for this year – Samsung has added cable management capability through the base of the TV stand for clean and unseen cable routing. 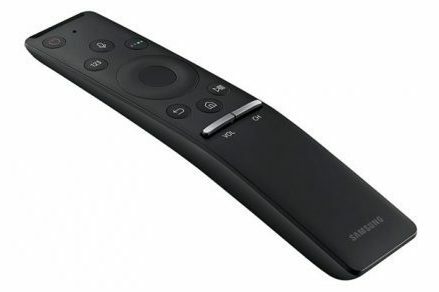 Smart Remote Control: Samsung’s latest OneRemote (TM1750A) automatically detects and controls all connected devices and content with no manual programming required. However, compatible devices are required to use this feature. The remote also supports voice control. Tizen 3.0 Smart Hub: The TV’s Smart Hub has been redesigned and offers even easier navigation, plus quick access; you can even use these convenient features while still watching TV. 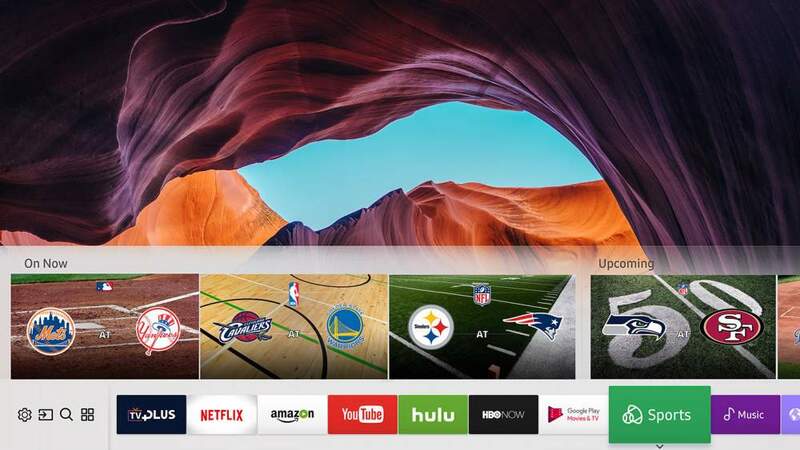 The new Smart Hub features easy access to content by displaying your favorite and most used TV applications, as well as recommendations for even more entertainment options. Smart Hub offers unique ways to search and access your favorite and new content from the TV’s tuner and network apps. HDR or High Dynamic Range (HDR10) provides increased contrast with a greater range of peak brightness (highlights) and black levels, in addition to better picture detail and more vibrant colors. 4K HDR EXTREME for increased contrast range between the darkest darks and lightest lights, plus expanded color and depth. HEVC/VP9 decoding for watching streamed 4K video sources like Netflix, Amazon Instant Video and YouTube. Note: There are no component or composite analog inputs available on this TV. The UN65MU8000 delivered pretty good overall picture quality. Picture images were generally sharp and detailed, with plenty of clarity and image depth with all HD content including 4K HDR, standard 4K and 1080p sources. The MU8000 series does not use quantum dot color technology like its predecessor – the KS8000; therefore, the color palette on the MU8000 wasn’t as brilliant or dynamic. Color reproduction on the MU8000 however, was still pleasing to my eyes, yet was somewhat lacking in purity and richness when compared to what the KS8000 was capable of. Furthermore, when displaying HDR content, the MU8000’s color space capability isn’t as wide as some other TVs in its class, which means it is limited on how many colors it can display and their intensity. Even though the MU8000 has some minor deficiencies with its color reproduction, its overall color performance was quite good, and was capable of delivering accurate and natural shades of colors that were solid and thoroughly saturated. A strong performance characteristic of the UN65MU8000 was it contrast range and black level capabilities; the content I used for evaluating black levels was rendered very well, showing very deep and solid black levels that left me with nothing to gripe about. As well as the MU8000 did with contrast range and black level performance, I must point out for the record that the KS8000 does have a better contrast ratio when compared to the MU8000, which allows the KS8000 to have increased peak brightness and better black level performance. Shadow detail on this TV was very good, and revealed proper amounts of shadow detail and depth among the objects within the dark and dimly lit scenes I use for evaluation. Black screen uniformity performance was great on this display. On a completely black screen I was not able to detect any light bleed coming from the corners or edges of the screen. However, you may experience some slight blooming around white text or white objects when set against a black background. Motion handling was very good on the MU8000 when viewing regular content that consisted of sporting events and movies with fast paced action. Additionally, motion judder was not an issue with this TV. Side angle viewing suffered from what I consider typical amounts of contrast and color saturation loss for an LED TV, but shouldn’t be a major issue unless you are watching this TV from wide angles. As a side note, I left the TV’s local dimming feature set to “Low” for non-HDR content. When set to the “High” position, I noticed it would make blacks in an image of a starfield (outer space shot) appear lighter. The MU8000 defaults local dimming to “High” setting for HDR content. I chose the “Movie” picture mode when setting up the MU8000 for evaluation. 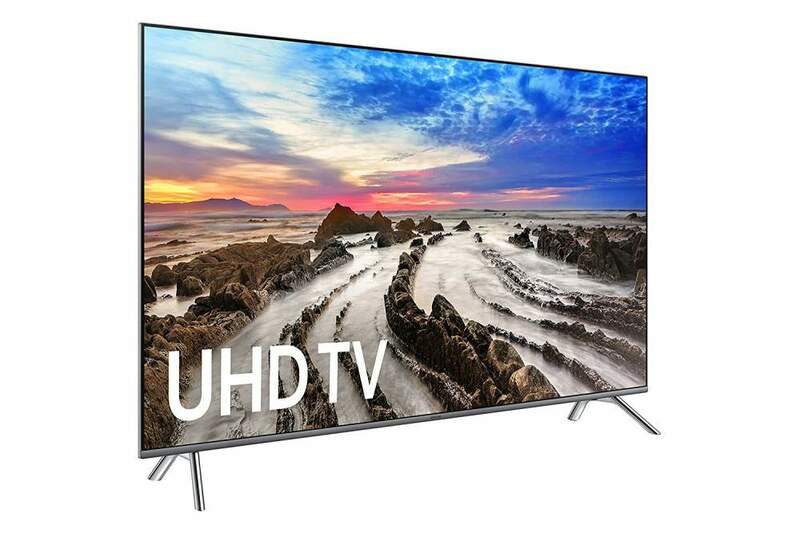 Samsung’s mid-tier UN65MU8000 delivers satisfying picture quality that should please consumers who aren’t looking for high-end performance from their 4K TV. It performs well in the key areas of picture performance, including very good contrast range and black levels. Its HDR images and color rendering aren’t the best I’ve seen, yet still get the job done. It has decent peak brightness levels, which makes it a good fit for rooms with natural daytime lighting, and its attractive design fits well with most room decor. In summation, the UN65MU8000 delivers the basics in performance and features (and more), which add up to a complete and enjoyable home entertainment package. •	With stand: 53.1 lbs. •	Without stand: 51.6 lbs. No, you didn’t make a mistake. Sure, the MU8000 is a mid-tier model when compared to the top-tier status of last year’s KS8000 which does have a few performance advantages that I mentioned in the review; nonetheless, the MU8000 performs quite well and I have no real (deal breaker) complaints regarding its core picture quality attributes for a 4K HDR TV in its class. So rest assured, you’ve made a good choice. Glad to hear you’re enjoying your MU8000, and thanks for the positive comments. I just bought Samsung 75-inch 8000 4K. Amazon and Netflix look great but my Dish channels are very bad, hd looks like sd. If you haven’t already done so, check your settings on TV and Dish receiver. Does the 65″ mu8000 have pip ability. It only shows one tuner so likely if it can be set up it would have to utililize the pvr tuner to function. To the best of my knowledge the US and Canada models do not offer this feature. Other regions do offer PIP with this TV when an external device is connected with an HDMI cable. I have a un65mu8000 tv. I’m not finding an optical out for audio. It’s about 2 weeks old. Maybe they eliminated it. Anyway, I have a Yamaha receiver from the 90s, model rx-v890, and would like to hook it up for surround sound. The receiver only has the rca inputs, red and white. Can this be done? I would hate to have to buy a new receiver. 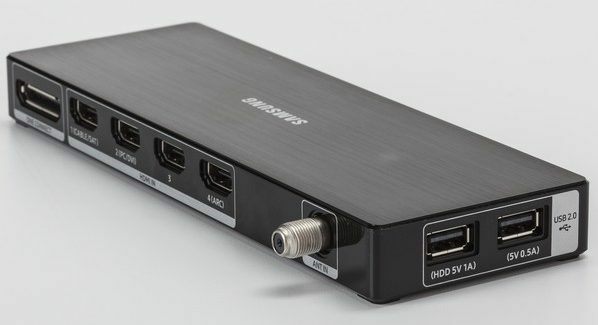 The digital optical output should be located on the One Connect Mini and not on the TV. You can purchase a digital optical to RCA converter from Amazon to use with your Yamaha receiver.